The geode is recognized, usually, but a spherical configuration which contains a cavity lines with a crystalline structure growing toward the center. 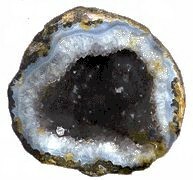 The geode structure itself exhibits several properties of the contained minerals. These properties include facilitation of astral travel and assistance in the pursuits of mathematics. The geode also allows one to both recognize and analyze the total picture prior to decision making. It allows one the freedom to mold and to shape ones own future, and assists one in attaining highly effective communication skills. It furthers ones connection to the higher forces and higher planes, stimulating the bridge of association with those of like pursuits. It can also be used in the treatment of disorders associated with the hands, lungs, and nervous system.